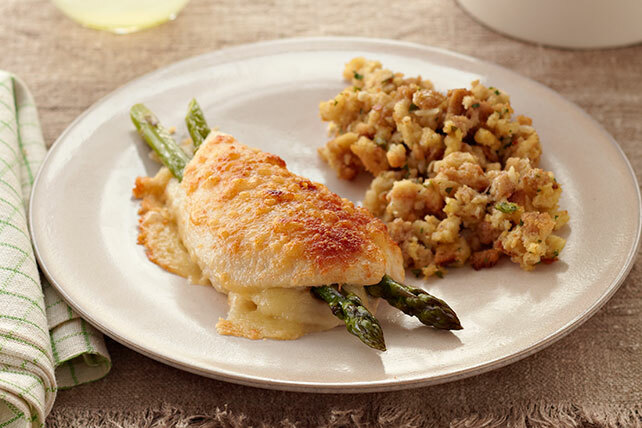 Skip the restaurant and try Parmesan-Crusted Stuffed Chicken at home! This scrumptious Parmesan-Crusted Stuffed Chicken is an easy homemade dish. Make cut in one long side of each chicken breast, being careful to not cut through to opposite side. Fill pockets with asparagus and shredded cheese. Place on baking sheet sprayed with cooking spray; top with Parmesan. Bake 20 min. or until chicken is done (165°F). Meanwhile, prepare stuffing as directed on package. Serve with chicken. Steam any remaining asparagus and serve on the side.